Diana Costanzo (second on right) is a volunteer for the Rockland Rowing Association’s Adaptive Rowing Program. She helps people with disabilities improve their coordination to row with confidence. According to the Census Bureau, an estimated 56.7 million people or 19-20 percent of the population in the United States, have a disability. Staying active while living with a disability can help people strengthen their hearts, build strong muscles and bones, improve coordination and make them feel better about themselves. For those with disabilities, there are many adaptive sports and recreation programs that can be enjoyed for health, wellness, leisure and social and competitive benefits. Paddling sports include canoeing, kayaking, rafting and rowing. Modifications are made to each rowboat, canoe or kayak based on needs, making it easy to participate in those organizational activities. Simple adaptations may be needed for positioning and gripping to allow people of all abilities to participate in paddling sports together. An indoor rower or rowing machine is a device used to simulate the action of watercraft rowing for the purpose of training for rowing or exercise. These indoor rowers are known as ergometers or ergs, which measure the amount of work performed. Rowing is the act of propelling a boat using the motion of oars in the water, displacing water and moving the boat forward. The difference between paddling and rowing is that rowing requires oars to have a mechanical connection with the boat, while paddles are hand-held and have no mechanical connection. Boats are rowed backwards because the human body has its muscle power concentrated in the back muscles, shoulders and biceps. This makes pulling a more efficient motion than pushing, meaning the rower becomes less fatigued, more energy is transferred to the oars and the vessel travels further with each stroke. Rockland Rowing Association is a community athletic organization and is a 501(c)3 nonprofit. 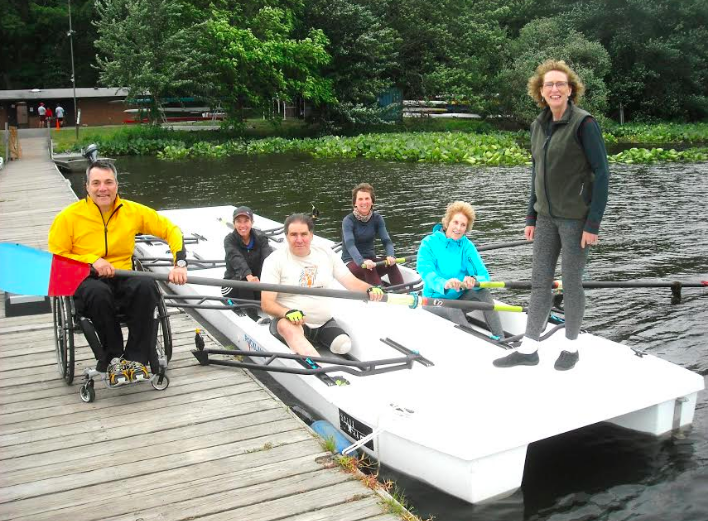 It partners with Helen Hayes Hospital, ARC and Jawonio to provide rowing opportunities to all, regardless of experience, abilities or background. For additional information, contact Coach Greta Nettleton at greta@rocklandrowing.org.